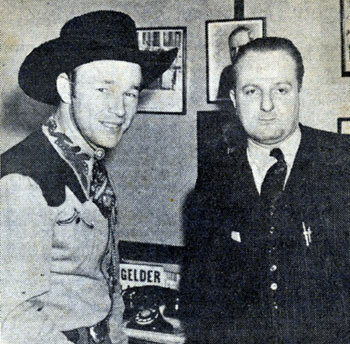 Tim Spencer, Roy Rogers and Bob Nolan on KFWB radio, Los Angeles. 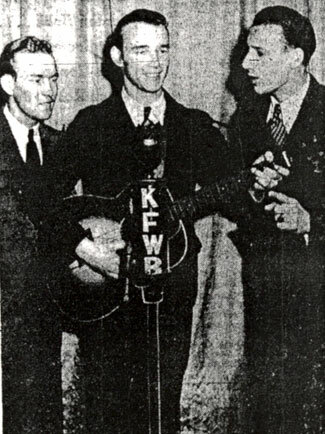 This photo from January 31, 1934, was when the trio performed for a Hollywood Chamber of Commerce luncheon at the famous Pig ‘n’ Whistle Cafe. 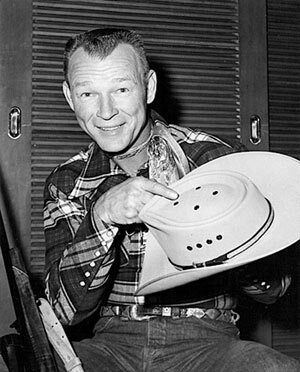 Roy Rogers with his one of his hunting hats. 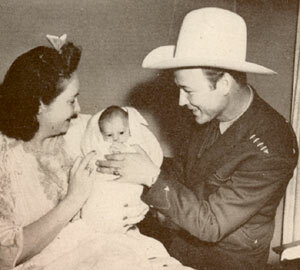 Roy Rogers and wife Arline with three week old Linda Lou who was born April 18, 1943. 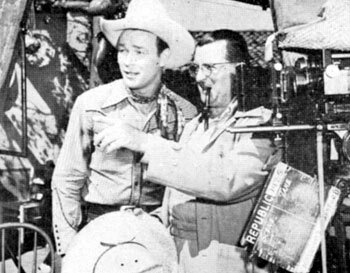 Director Frank McDonald discusses the next scene of “Along the Navajo Trail” (‘45) with Roy Rogers. 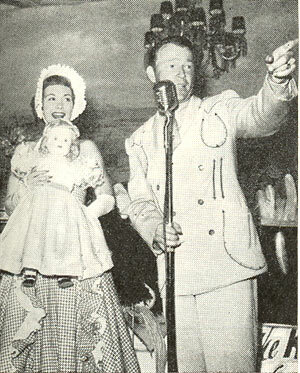 Jane Wyman and Roy Rogers at a 1950 benefit for visually handicapped children. 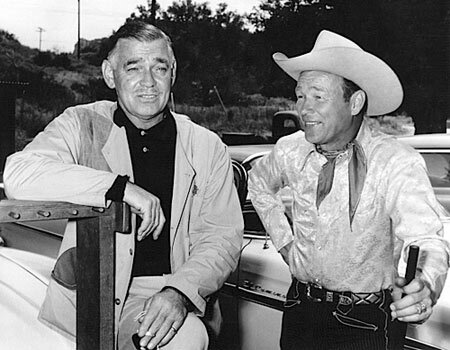 Roy Rogers and Clark Gable when Roy purchased Gable’s Pigeon grade Model 12 shotgun. 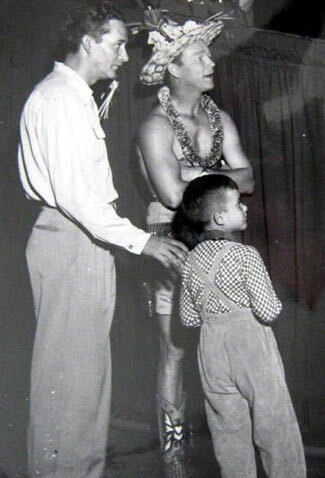 Story is, Gable was having a bad day at the trap field, so as he came off the field he held up the shotgun and begged someone to make an offer for the SOB shotgun. Roy quickly responded and bought the gun for $600. He promptly went out and shot 50 clays in a row and from that day on he didn’t bother with another shotgun. 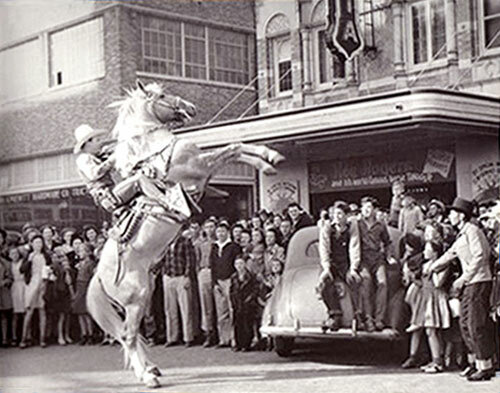 Roy Rogers and Trigger give a little nudge to comic actor S. Z. 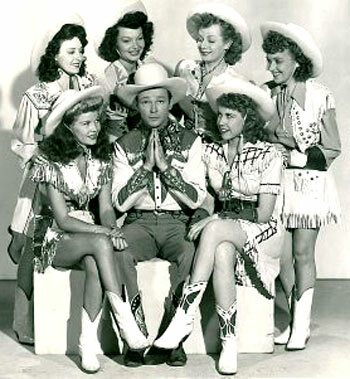 “Cuddles” Sakall at the Hollywood Canteen, sometime in the ‘40s. 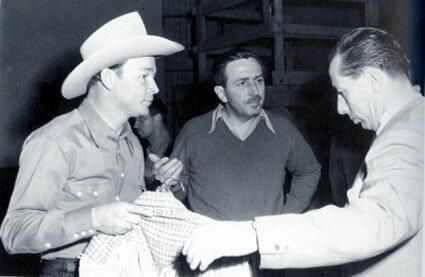 Roy Rogers meets with Walt Disney (center) and a Disney costumer preparing for Roy’s role in the “Pecos Bill” segment of “Melody Time” (‘48). 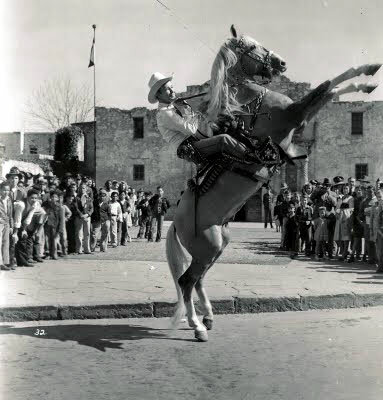 Roy Rogers and Gabby Hayes are greeted by the Mayor of Ft. Worth (right of Gabby) in 1958 as Roy arrives to host a TV special at the annual Ft. Worth Stock Show. 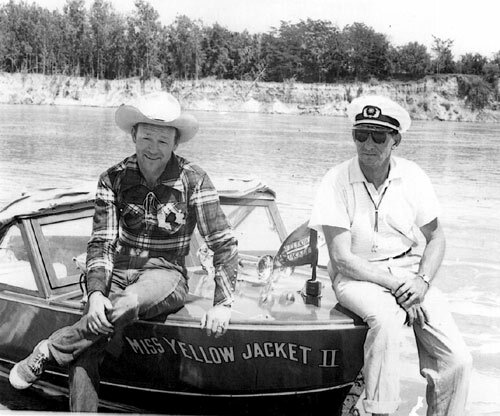 Down in Texas, Roy Rogers sits on his speedboat, Miss Yellow Jacket II. 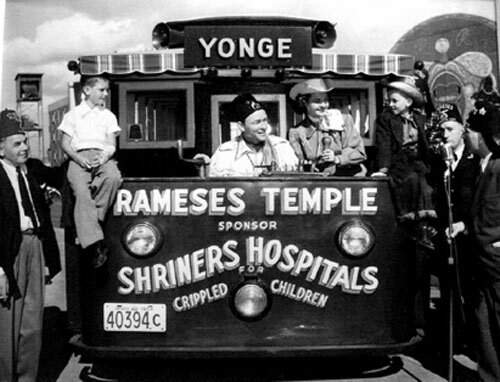 Roy was a part owner for awhile of the company which was in operation from 1949-1959. 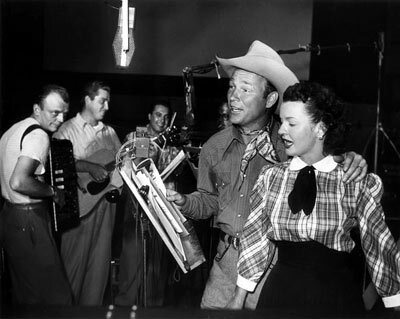 Roy Rogers and Dale Evans recording a song together in 1955. 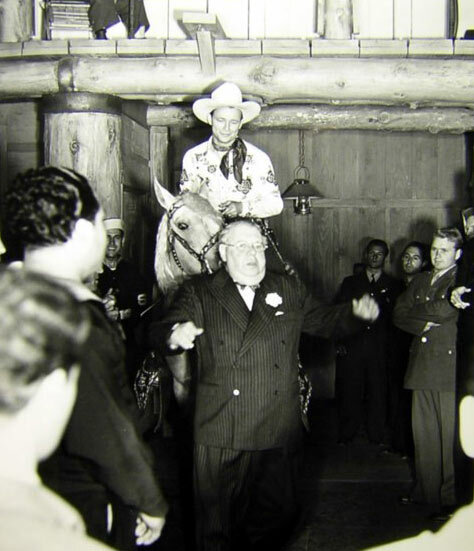 Roy Rogers in 1940 with Larry Stein, District Manager of Warner Bros. Theatres in Illinois, arranging a personal appearance for Roy at the Paramount Theatre in Chicago. 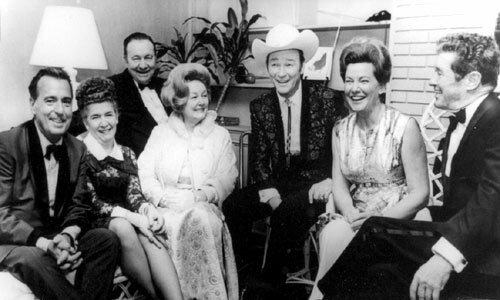 A great gathering...(Left to Right) Tennessee Ernie Ford and his wife, Tex Ritter and wife Dorothy Fay, Roy Rogers, Minnie Pearl, Roy Acuff. What some celebrities go through for publicity! 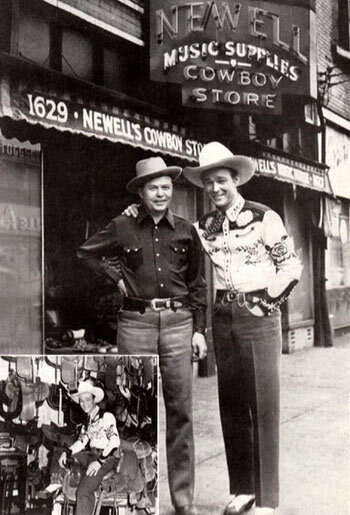 Roy's western wear Hawaiian style. 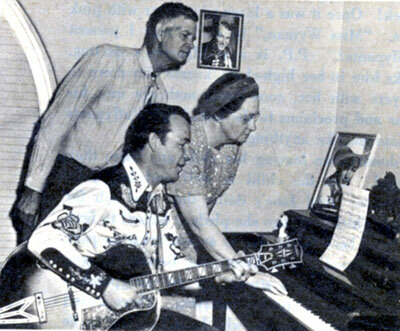 Roy Rogers takes a little musical break with Maw and Paw (Grace Stafford and Dallas McKennon) of the “Maw and Paw” Walter Lantz cartoon series in ‘53. 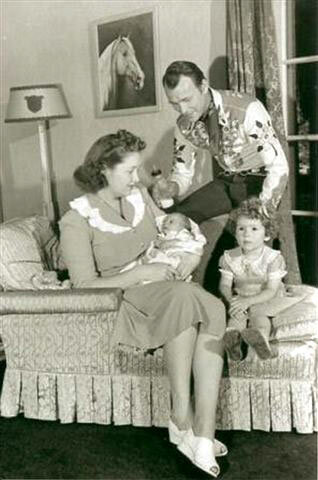 McKennon later played Cincinnatus on “Daniel Boone” and Stafford was Lantz's wife. 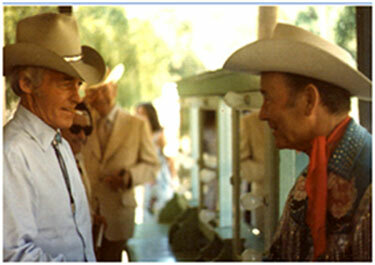 Both were active in voice-over work for years. 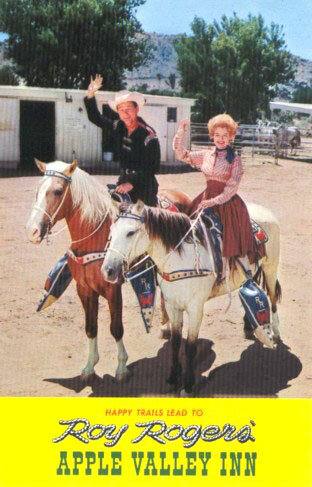 Brochure advertising Roy and Dale’s Apple Valley Inn. 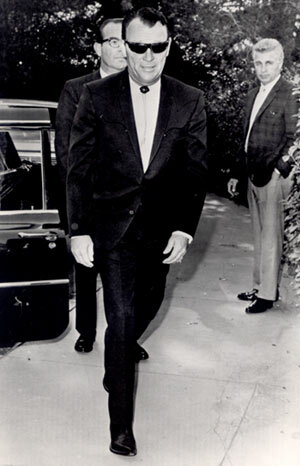 Roy Rogers arrives at Forest Lawn Church of the Recessional in Glendale, California, on November 4, 1965 for funeral services for his adopted son Pfc. John David (Sandy) Rogers, 18, who died earlier in the week in Frankfurt, Germany. 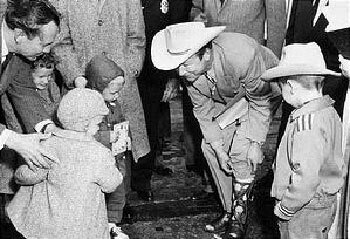 Roy Rogers shows his boots to a group of young fans in Nashville, Tennessee. 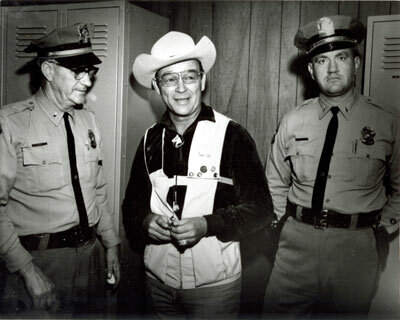 Roy Rogers poses in 1966 with Lt. Ralph Staples (left) and Lt. Lee Tye (right) of the Johnson County, Kansas, Sheriff’s Department. 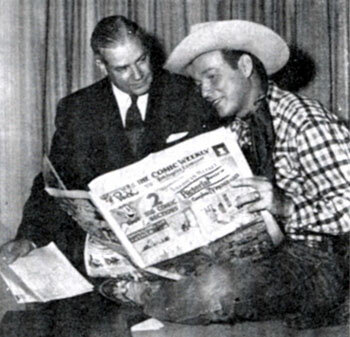 In July 1952, Roy Rogers and Phillip J. Sheridan of the Hearst Newspaper organization look over the Hearst comic weekly “Puck” as they sign contracts for the largest single insertion order of its kind on record. 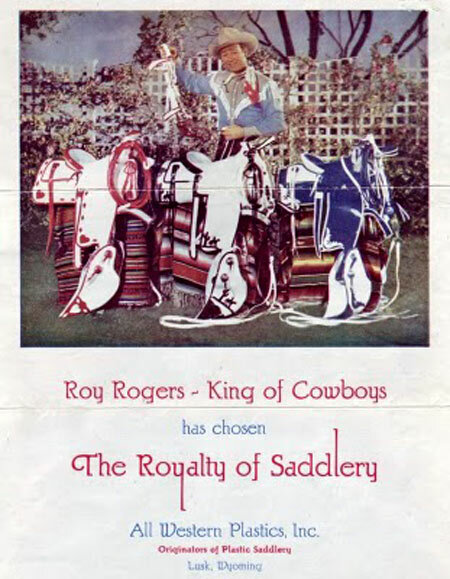 The $75,000 double-truck, four-color spread for Roy Rogers Enterprises as Christmas gift suggestions proposed by 71 firms manufacturing clothing, furnishings, toys and novelties bearing Rogers’ brand ran in “Puck” around Christmas 1952. 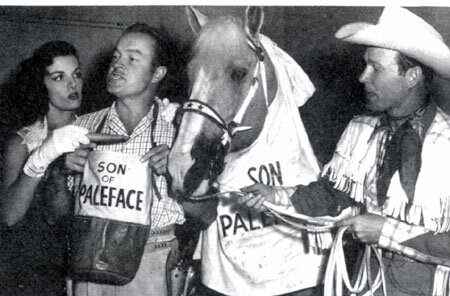 A Paramount Pictures gag shot for “Son of Paleface” (‘52) shows Bob Hope and Trigger both wearing their feedbags as Roy Rogers holds Trigger’s reins and Jane Russell offers Hope a carrot.